Before you can set up Windows devices for Microsoft 365 Business users, make sure all the Windows devices are running Windows 10 Pro, version 1703 (Creators Update). Windows 10 Pro is a prerequisite for deploying Windows 10 Business, which is a set of cloud services and device management capabilities that complement Windows 10 Pro and enable the centralized management and security controls of Microsoft 365 Business. If you have Windows devices running Windows 7 Pro, Windows 8 Pro, or Windows 8.1 Pro, your Microsoft 365 Business subscription entitles you to a Windows 10 upgrade. For more information on how to upgrade Windows devices to Windows 10 Pro Creators Update, follow the steps in this topic: Upgrade Windows devices to Windows Pro Creators Update. See Verify the device is connected to Azure AD to verify you have the upgrade, or to make sure the upgrade worked. Once all Windows devices in your organization have either been upgraded to Windows 10 Pro Creators Update or are already running Windows 10 Pro Creators Update, you can join these devices to your organization's Azure Active Directory. Once the devices are joined, they will automatically be upgraded to Windows 10 Business, which is part of your Microsoft 365 Business subscription. For a brand new device running Windows 10 Pro Creators Update, or for a device that was upgraded to Windows 10 Pro Creators Update but has not gone through Windows 10 device setup, follow these steps. 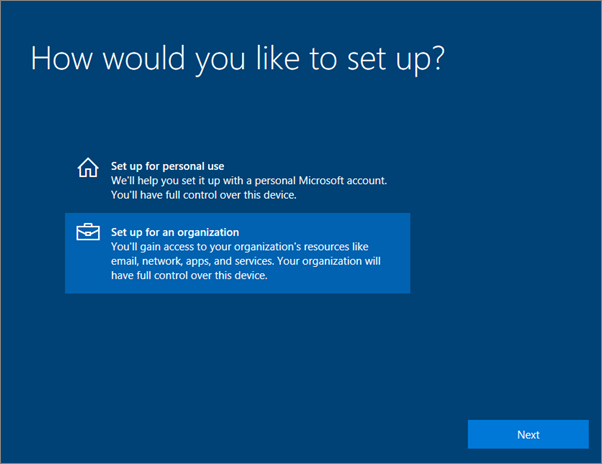 Go through Windows 10 device setup until you get to the How would you like to set up? page. 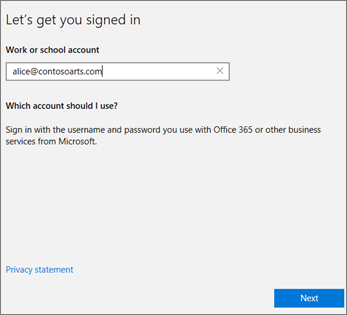 Here, choose Set up for an organization and then enter your username and password for Microsoft 365 Business. Once you're done, the user will be connected to your organization's Azure AD. 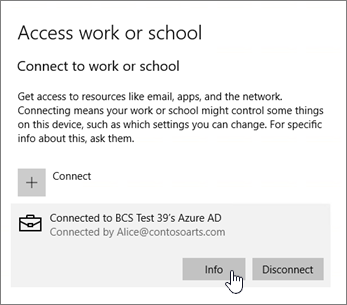 See Verify the device is connected to Azure AD to make sure. 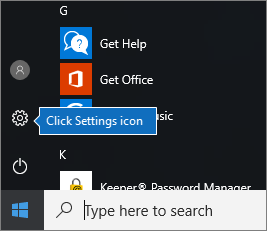 In your user's Windows PC, that is running Windows 10 Pro, version 1703 (Creators Update) (see pre-requisites), click the Windows logo, and then the Settings icon. On Your info page, click Access work or school > Connect. 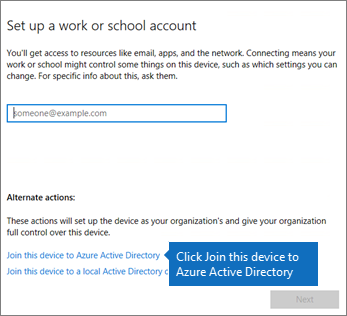 On the Set up a work or school account dialog, under Alternate actions, choose Join this device to Azure Active Directory. On the Let's get you signed in page, enter your work or school account > Next. On the Enter password page, enter your password > Sign in. On the Make sure this is your organization page, verify that the information is correct, and click Join. On the You're all set! page, click Done. If you uploaded files to OneDrive for Business, sync them back down. If you used a third party tool to migrate profile and files, sync those also to the new profile. 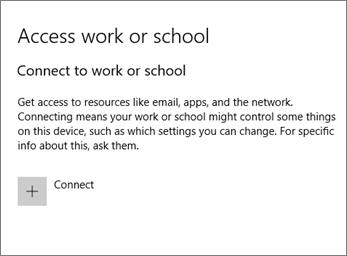 To verify your sync status, on the Access work or school page in Settings, click in the Connected to _ <organization name> _ area to expose the buttons Info and Disconnect. Click on Info to get your synchronization status. On the Sync status page, click Sync to get the latest mobile device management policies onto the PC. 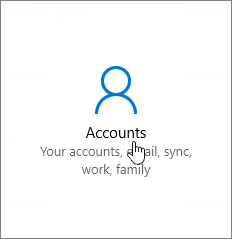 To start using the Microsoft 365 Business account, go to the Windows Start button, right-click your current account picture and then Switch account. Sign in by using your organization email and password. Verify that your Azure AD joined Windows 10 devices were upgraded to Windows 10 Business as part of your Microsoft 365 Business subscription. Go to Settings > System > About. 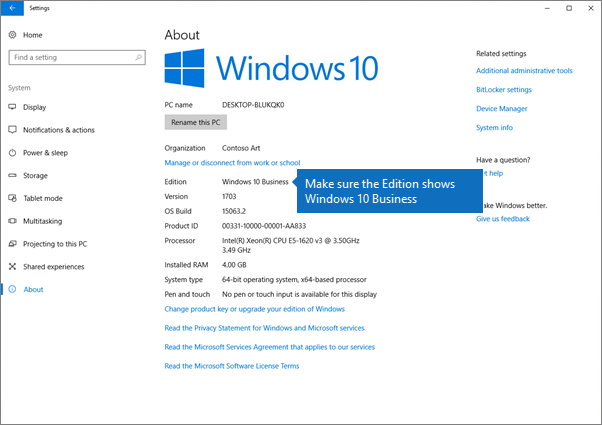 Confirm that the Edition shows Windows 10 Business. To set up your mobile devices, see Set up mobile devices for Microsoft 365 Business users, To set device protection or app protection policies, see Manage Microsoft 365 Business.